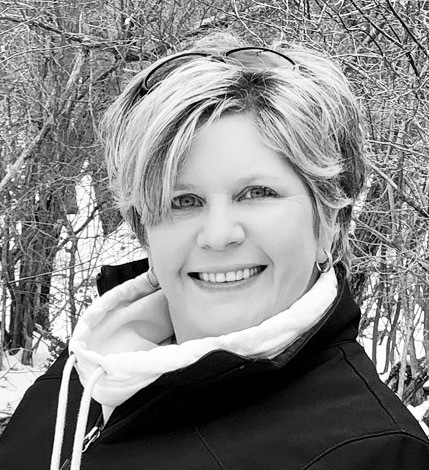 I'm super excited to be a part of Jo's Blogaversary Blog Hop. Jo has been a long time follower of my blog and I was so thrilled when she asked me to participate in celebrating her 4th Blogaversary. Happy 4th Jo! Our challenge was to make anything but a card. So with my new space I thought it needed a sign to welcome visitors to my loft. Here's what I made. I started off with a blank wooden sign I picked up from Hobby Lobby and painted it with a coat of gesso. Each of the 4 boards are painted in different shades of my favorite color blue and then dry brushed with the base color from the board below it. I hope I'm describing that correctly. Here are the colors I used: (the paints are all by Folkart) Sky Blue, Jamaican Sea, Deep Ocean Blue, and Cayman Blue. The letters are white stickers from Hobby Lobby by the Paper Studio Company. I added a coat of matte medium to keep them from peeling off in the future. Plus I moved them so many times trying to line it up perfectly that some of the corners lost their stickiness. I also added some flowers using a Prima flower pack I found at Hobby Lobby as well as a canvas flower. I hot glued those to the upper and lower corners. My quote is inspired by some quotes I've seen on Pinterest. Jo is giving away prizes during the hop...Here's how it works. and here are the prizes you could win! and under my signature you can find all the stops for this fun hop. Thanks everyone for stopping by and I hope you have fun on the blog hop. Fabulous sign! Fun colors~the different shades look amazing and love the flowers! What a wonderful sign. LoVe it. Thanks for sharing. 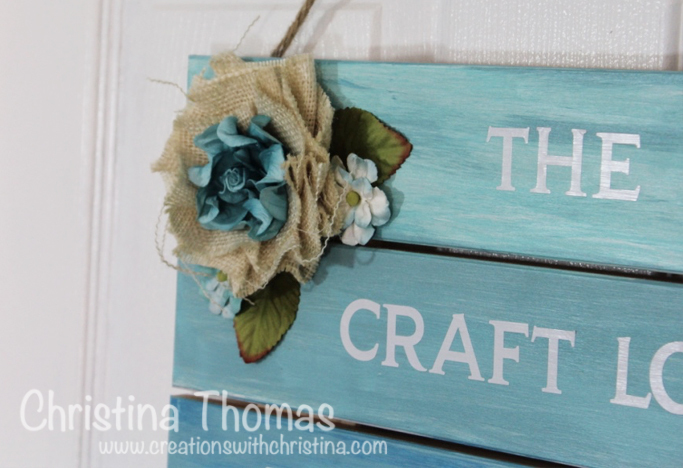 Oh Christina this sign for your craft loft is just beautiful! The different shades of blue are gorgeous all next to one another. It looks ombre and I think that was the look you were going for by the way you described it. The shades flow together beautifully. I love the little floral clusters you created for the corners and your quote is just perfect, truly is perfect. I want to thank you so very much for participating in my 4th year blogaversary celebration! It means so very much to me. You have been a huge inspiration for me throughout the years and to have you by my side this year is truly an honor. So thank you! This is so beautiful. Love all the details. WOW!! This is absolutely GORGEOUS!! The colors are s Beautiful!! What a gorgeous sign you have created! I love your sign. Great job. Glad to be on this blog hop with you and Jo. Have a wonderful day and I love your loft. 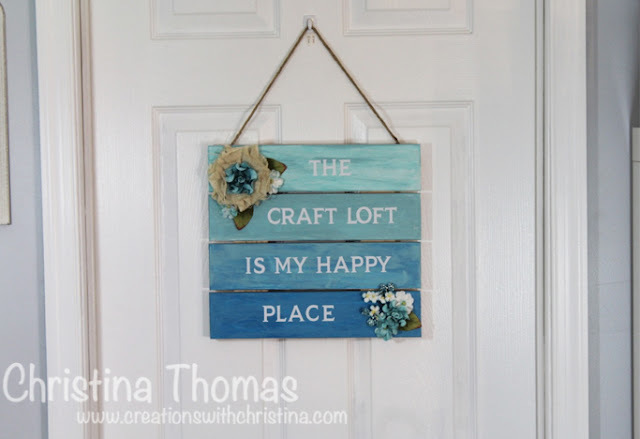 Fun welcome sign for your new space! I love the ombre colors! I'm new here to your blog and signed up to follow via emails! This sign is beautiful!! And it will definitely make you smile each time you enter your crafty space. Love the color (as blues are my favorites, too) and the ombre look is fabulous. Nice sign, love the colors. They remind me of being at the beach. Such a cool sign love those colors and your flowers are absolutely beautiful! Love your pretty sign. Looks wonderful with ombre colors and the sweet flowers. We all can relate to the sentiment!! So glad to be a follower of your blog!!! great project! I would hang this on my door, but my mother would love it even more! 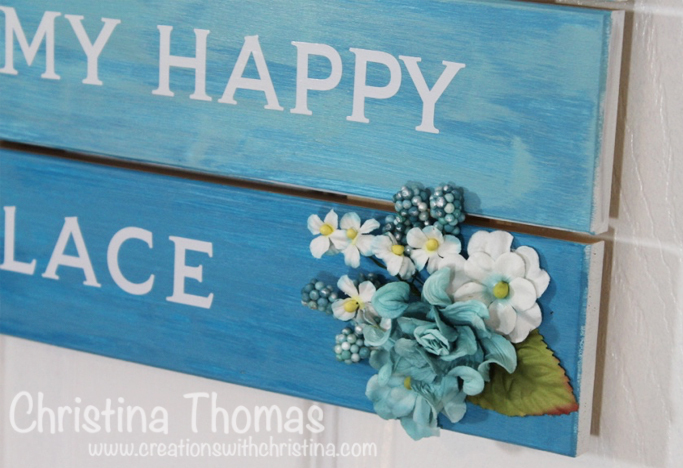 What a BLUEtiful project - love how soft and calm the colors are - you have created a thing of beauty!! How true that statement is. I love your sign. I love your loft sign! I love those colors too!! Love your sign and painting technique. I'm not hopping - just don't have time - but had to comment on your work. Different variables are likewise mulled over, for example, stickiness, temperature, static preloads, and vibrations that can influence the wood amid machining process.